Kettle, pots and pans, draining board, plates, cutlery set, broom, coffee cups/glasses, hand towels/dishcloths, mixing bowls, salad bowl, assorted kitchen utensils, steak knives, colander, can opener, corkscrew, cutting board, food savers, coffee filter & thermos, teapot, basic tool kit, flashlight, axe, lawn chair, instruction manual, road maps/directions, bucket, extra dinner set (guest), dustpan, clothes hangers and clothespins . Children under 6 months old are permitted (certain conditions apply). 2 child seats or 2 boosters seat (or 2 seats, any combination) can be installed in this vehicle. Founded in 1969, Fraserway is rated highest by travellers among RV rental companies in Canada. 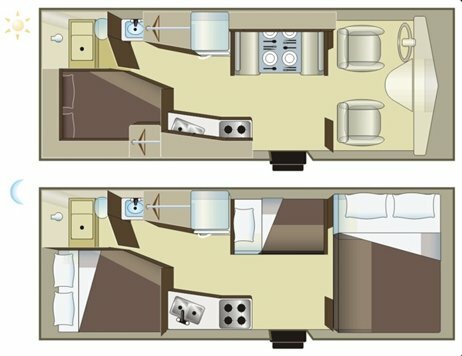 Fraserway also offers a wide variety of models, including the smaller “ truck campers” , which are becoming increasingly popular with RV enthusiasts. Rental staff speak several languages, and the fleet of vehicles is the youngest in Canada. 70% of the vehicles are under one year old. FREE GPS RENTAL (exclusive to Authentik Canada ). Airport transfers included, as well as certain downtown transfers (some conditions apply). FREE bedding special for bookings made before January. Morning pick-up at no extra charge. Pets are allowed, for an extra fee of $100. Unlimited kilometres option available only for rentals of 14 days or more.